It’s all about the energy. Energy is everything and everything is energy. Before Archangels can really help you manifest your dreams or anything else, you absolutely have to raise your inner-vibration. this is true for everyone, no matter where they are on their Spiritual Path or where their prosperity and abundance levels are. The person you are right now will not — I repeat — will not get you to the next level in your life and work. Now, before we go any further, this is true whether you work for someone else or have your own business or want to start living your purpose full-out. Another way of looking at mental and emotional paralysis is staying where you are, in your Zone of Dis-Comfort no matter how much you hurt or hate it. Being energetically paralyzed by fear and doubt, literally robs you of your hearts desires. Ask Archangels to help you dig deep, finding the inner-courage, strength and determination to take that next step no matter how frightening or difficult it feels. Don’t get stuck or hung up on which Archangels to call on. It’s more important to be open to asking for and being open to receiving guidance. Focus on the obstacle or negative energy block dissolving, being blasted apart or simply melting into nothingness. Close your eyes and imagine erasing the hurt, fear and doubt. This is so simple, your Human-Self — Ego-chitter chatter — will tell you it simply won’t work and I am telling you airy-fairy out-there nonsense. You will be tempted to not even try it or discount it as useless. If what you’re doing isn’t working as well as you want it to or not working at all, you have nothing to lose except negative energy blocks. Write out what you want. Tell a story of what you want your life to look and feel like. Be as detailed as you want. Actually, the more specific you are, the more you channel your energy into bringing to life and manifesting your dreams, goals and desires. Archangels will help you re-focus your thoughts; eliminate old beliefs that never really worked for you to anyway. Here’s an easy way to ask Archangels to help you — Archangels please help me with (you fill in the blank) … help me easily recognize the guidance and messages you have for me. Thank you. Now, this is where it gets tricky — believe your request is heard and honored. If you’re open and willing to become consciously aware of what shows up for you, you will truly be amazed. The only limit on what and how Archangels are able to guide, heal and help you, is your own imagination. Close your eyes, breathe deeply, open your heart-center and invite these amazing Archangels into your life. You will never be the same. There are times in everyone’s life when they just don’t feel like they can go on doing what they are doing. Something will have happened to trigger what I refer to as an Energy Wall, also known as resistance. Sometimes an Energy Wall can be so intense; it causes or triggers an even deeper Spiritual chasm, a Dark Night of the Soul. A Dark Night of the Soul is an inner-journey questioning beliefs at the core of your Being and understanding. It is often life-changing, like a re-birthing, a complete transformation from the inside out at every level imaginable. As I write, channel and stream the information in these pages, I am being guided to share part of my personal journey with you in an effort to help you gain a much deeper understanding of what it truly means to be supported and infused with loving healing Archangel energy. If I haven’t mentioned this before, Angels have different vibrations. Archangels vibrate higher, or faster, than Guardian Angels whose energy is more dense, which enables them to connect with you more easily. It’s no secret what I came here to do is help as many men and women with their Angels in ways that work for them and also help raise their inner-vibration so they can fulfill their purpose, with prosperity and abundance. To this end, I am often pushed beyond the limits of what I feel is possible. Each time I bump against the edge of my current comfort zone, it’s time to step back, re-ground and balance once again. Recently, I journeyed into a very intense Dark Night of the Soul. The last time my inner-journey plunged me into such depths had been 18 months earlier. This most recent inner-journey lasted ten days before I would begin to see even the tiniest glimmer of light. The complete cycle would last more than three weeks, from start to finish. During this time of transition, transformation and eventual re-birth, Archangels were by my side even hen I did my best to shut them out. Little by little, their loving, forgiving, compassionate, healing energy gave me hope and the courage to walk through the darkness and into the Light. The point is, no matter who you are, what have done or experienced …. if you are willing to be open enough to surrender into trust and faith, Archangels will guide you through to the other side. Archangels are always with you. They only want what you want for yourself. There is no judgment. There is only compassion and a sense of harmony and peacefulness. In those moments of complete and utter trust and faith, know you are loved beyond measure, know you have been infused with loving healing energy in the way only Archangels can fill your body, mind and Spirit. There will be a sense or feeling of deep contentment even if on the surface, things appear to have fallen apart all around you. If you will allow, Archangels will hold your hand, heal your heart and clear your path. One of the most precious gifts you could ever give or receive is Unconditional Love. There are many mis-conceptions about Unconditional Love and what it means or what it is. For a long time I didn’t fully understand what it is, how to give and receive such a life-altering, elusive gift. In an effort to remain authentic, in integrity and transparent, there are times and certain situations that I am not practicing or giving Unconditional Love to others or even to myself. This is my understanding of what Unconditional Love is and how to practice giving and receiving it. Here’s what it isn’t, which is just as important as what it is.it is NOT about giving anyone permission to dis-honor or disrespect you. It is NOT about allowing anyone to violate your values or boundaries. It is NOT about letting anyone take advantage of you in anyway, for any reason. Now that, hopefully, you have a deeper understanding about what Unconditional Love isn’t, here’s what it is all about. Taking a very deep breath, I am reaching deep within to put into words, with help from Archangels, a concept that is pure energy from Angels and Divine Source. Unconditional Love is the exact opposite of conditional love. There are many others ways people give conditional love, but you get the idea. Conditional love is all about strings, exploiting your weaknesses, laying guilt trips and emotional blackmail to get their way. it also includes withholding affection and emotional support. Do you really want someone you had the courage to open up too secretly thinking negative thoughts about your dreams and goals or your inner-most dreams? I think not. Give what you want to receive. You don’t have to like what someone wants to do or how they live their lives. This isn’t about giving anyone permission to intentionally harm someone else with words or actions. Getting back to Unconditional Love, the first person to practice on is you. Can you love yourself in spite of your flaws, fears, the mistakes and missteps, the many distractions and not feeling like your living up to your own potential? Be honest. If the answer is “no” then start practicing loving yourself with all the warts, scrapes, dings, bruises and scars you carry with you in your thoughts and in your heart. When you can love someone who has hurt you or broken your heart, you’ll know you have really begun to shower others, including yourself, with Unconditional Love. 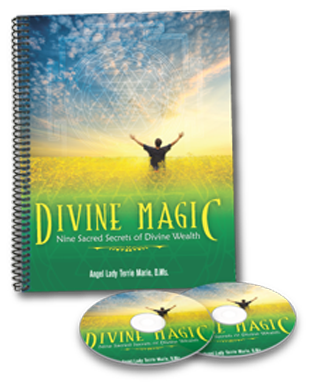 Now imagine having or experiencing this amazingly pure energy coming from Archangels to you, surrounding you and infusing all that you are. Angel energy is like nothing you have ever experienced. All Angels have and give you is support, total acceptance and Unconditional Love. Archangels do not have conditions or judge you in any way. they just want you to know you are never alone and that you are loved beyond measure. In those moments you fell defeated, alone, worthless or lonely, ask Archangels to wrap their loving healing energy around you. Keep asking till you feel an energy shift. You will feel a sense of calm and peacefulness within. Be open to receiving this, until now, precious elusive gift of Unconditional Love. How many times you heard … when one door closes, a window opens? Maybe you have even said it to yourself to help ease the sting of disappointment or tried to help someone else. It never set well that what was being offered — a window — was less than I was being guided away from. Since everything — experiences, lessons, situations and relationships — offer gifts of healing, release and a chance to raise our inner vibration, it just resonates so much better to have at least 2 new doors open, replacing the one that closes. There is a different word I like to use instead of door — portal — it is so much more expansive and all encompassing. A portal is a doorway, channel or vortex of concentrated energy. One of the many challenges we all face on our Spiritual Journey, Is not allowing ourselves to get stuck in negative energy, mentally or emotionally. Just to be clear, if we pretend or try to ignore the rubbish that happens, we start stuffing or swallowing our feelings. This creates blocks in the Throat Chakra and dis-ease in the physical body and ultimately lowers your inner-vibration. Wherever your inner-vibration is, that’s the exact point of attraction that is projected outward, bringing to you an exact, vibrational match. If you’re wondering what this has to do with Archangels opening doors to limitless opportunities for you, it has everything to do with it. And here’s why. To be able to attract more of what you want and so much less of what you don’t, your inner-vibration must be more positive, more often than it is negative. Another way to explain the importance of being aware of and knowing where you are energetically, is keeping you connect to Archangels open. When you’re not at your best, it’s harder to be aware of and recognize guidance, messages and signs that are being given to you. You can ask Archangels to help you honor what you are feeling in that moment and move through it more quickly, restoring your positive mental and emotional energy to higher vibrations. It’s perfectly okay to give yourself time to process what’s happening and what you are feeling. Once you are able to ground, cleanse and release negative energy from your thoughts, heart center and in your environment, take a few moments to re-focus yourself. Ask Archangels to help you re-connect with your Inner-Spirit, your dreams and your purpose. Write out what you seek to attract to you, be as specific as you can, being mindful not to create self-imposed limitations. When one door closes, it’s telling you to re-direct your thoughts, emotions, efforts and energy in another direction. This new direction, as painful or scary as it might be, is for your highest and best good, trust Archangels are with you guiding every step. Ask for help clearing your path in all ways, on all levels of vibration and in all directions of time and space. There are so many more opportunities and possibilities in front of you than there are behind you. Trust and have faith that what’s being shown to you is the next step in achieving your goals and manifesting the life you yearn to create for yourself and your family. Take a deep breath because it gets better even if it doesn’t seem like it at the time. There is always a choice to keep moving forward, stay stuck where you are or simply turn around and go backwards. When the Angel Lady is being interviewed or speaking to International audiences, her high energy ignites the atmosphere with her empowering message, her unconditional love shines bright, and intuitive insights flow through her. She creates sacred space to transform goals and dreams into reality. Archangels have a higher vibration than Guardian Angels. They are messengers of and for Divine Source. In a sense, Archangels act as intermediaries between humankind and Divine Source. These magnificent beings of Light and Love, like all Angels, are gifted with being in all places in any moment, transcending physical realm limitations of time and space as we know and understand it. Archangelos is the Greek word for Archangel which means primary messenger or influential being of Light and Love. Welcoming Archangels into our lives, invites the gift if miracles that simply manifest in interesting and unexpected ways. They have been gifted with the ability to transform dense, leaden earth energy through the transmutation process otherwise known as Spiritual Alchemy. Spiritual Alchemy is a Metaphysical process of removing energy blocks — mentally and emotionally — enabling us to raise our inner-vibration to the next level. Archangels also protect you from harm by guiding you away from people, places and situations that are not for your highest and best good. 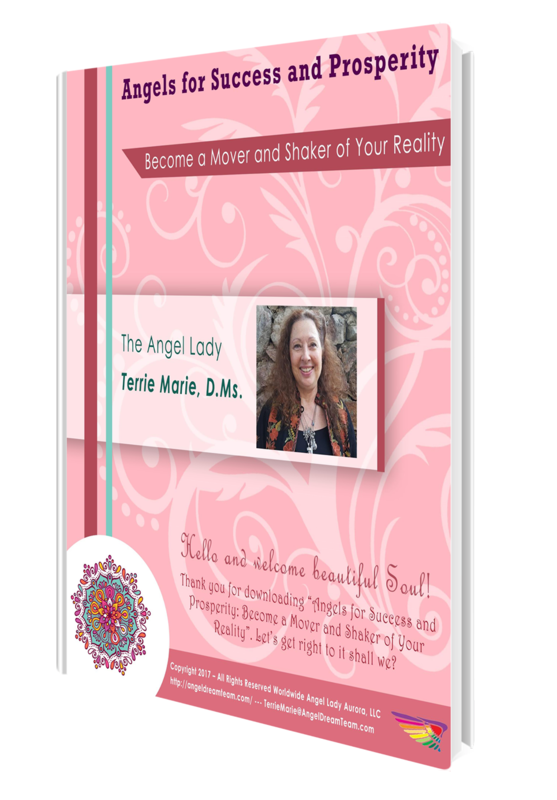 Angel Lady, Terrie Marie specializes in showing men and women how to directly access and receive Divine Guidance through their Higher-Self and Angels. Raise your inner vibration, your Divine Wealth Frequency, change thought patterns, enhance the Law of Attraction and magnify your manifesting power. She helps you discover and explore practical, easy-to-use techniques, tips and tools to increase prosperity and abundance, with more harmony and less stress. The Angel Lady shows you how to trust your intuition and gut feelings with a heightened sense of empowerment and confidence. Her subtle, powerful insights create life-changing transformations from the inside out. Terrie Marie has helped amazing men and women in Australia, South Africa, Germany, Canada, United Kingdom, Mexico, Sweden, Brazil, Belgium New Zealand, and the United States. Terrie Marie, D.Ms. has the unique ability to connect and communicate with Angels which makes her a highly sought after Angel Mentor and Angel Whisperer. Do you know someone or perhaps you might feel as though there are experiences that seem to keep showing up in your life with a familiar pattern or set of circumstances? When we, as humans, haven’t truly allowed ourselves to heal, release and ultimately let go, we can and often do repeat patterns that we really wish were broken. Somehow, it feels like no matter what you do things keep showing up the same way or just slightly different but in the end the results or lack of results are the same. Archangel Raphael, whose name means, He Who Heals, will help you heal your thoughts and your emotions. As you release everything that is truly behind you and in the past, you free yourself from repeating the same patterns or lessons over and over again. The key is to be willing to dig below the surface, get honest with you about what is or isn’t happening and then make a commitment to yourself to do things differently. This Archangel will help you heal relationships, beginning with the relationship with yourself. He will help you heal a broken heart, restoring the capacity to trust, love and have faith that you will again be happy. Archangel Raphael helps soften your heart, accepting that you are whole complete and perfect. When we hear or read these words, it can bring feelings of resistance or denial that we are anything but loved, whole, complete and most certainly not perfect! The truth is that you are whole, complete and perfect. It’s the ego-chitter chatter that gets in the way of believing and accepting this truth. If we listened to ego-chitter chatter, which we all do, myself included, we would be see our lives filled with pain and sorrow, doubt and fear, chaos and confusion all under the label of protection and within boundaries that restrict movement and free flowing energy. There is a place and a need for the ego in our lives. BUT its need to run everything will have you running in circles. Ego will have you believe that fear is your friend. The Healing Archangel will help you know the truth of what it means to be whole, to be loved and loving, to feel and be complete with a sense of compassionate humility in accepting that you are perfect. He will help you go within, discovering or re-discovering the areas in your life that you really want to change, shift and ultimately transform into something more positive and supportive of whom you truly are and what you are here to do. Dissolving bitterness, hate, envy and even jealousy brings a sense of relief freeing your energy blockages that truly block the very things and kinds of relationships you really want to attract and have in your life. No matter what, it’s imperative that you keep your heart open to love and being loved. If you choose to live without love, thinking you are only keeping yourself safe from harm, you are actually causing more harm to yourself. In closing off your heart center, you close your thoughts, emotions and your energy to receiving very much of anything. When one closed door, all others are less open, which causes your energy to become restricted and eventually blocked. Archangel Raphael will help you remember that you are loved, treasured, valued and priceless. Be compassionate with yourself as you begin or complete the healing process. Remember to forgive others and to forgive yourself for having believed you were or are ever anything less that loved, whole, complete and perfect. You are you. There is no other like you. Be willing to see yourself in the light of love and in the light of truth. You are unique; there is no one else anywhere that is exactly like you. You are a treasured, priceless jewel. There is no one else that can or will walk the way you walk, speak the way you speak, love the way you love. Only YOU can share the message you came here to share in exactly the way you came here to share it. Your thoughts are unique. Your emotions are unique. Your message is unique. You are unique. Your energy, your inner vibration is what sets you apart from every other human. It is that simple and that complex all in the same moment. 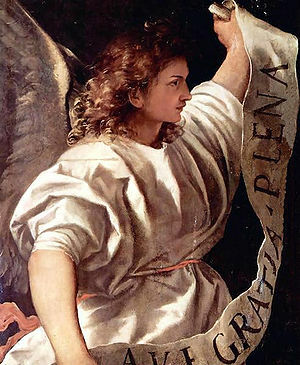 Archangel Chamuel, whose name means, He Who Seeks God, helps you express your uniqueness with confidence and with a sense of empowerment from deep within your heart center. He will help you see your own value and how being of service benefits your clients and customers, family, friends and yourself. Once you accept who you are and the message you have to share, you will experience a sense of freedom and confidence to shine brightly, attracting to you all you need, want and desire. Empowerment is believing, behaving, speaking and living from a sense of confidence, freedom, determination and commitment, that no matter what you will do what’s necessary and required of you to share your unique message in a way that is authentic, humble and filled with compassion, integrity, truth and light. This Archangel helps you build a strong foundation for your personal and professional life. He will keep you motivated, taking the next step or set of steps bringing your goals and your inner vision into physical form almost as if by magic right before your eyes! He will help you stay the course, focusing your thoughts, emotions and your energy as you share your unique talents and gifts with the world in which you live, love and play. Archangel Chamuel helps you become aware of shortcomings, the obstacles that have, in the pas kept you stuck, using each obstacle or block as stepping stones. Each stepping stone that is below your feet and now in front of you, raises your inner vibration, creating a strong, solid foundation for your life personally and professionally. He empowers you so that you honor what brought you to where you are and where you are going. You are unique, a unique, priceless jewel who has so much to share with yourself and with others than you can possibly imagine in this moment. Archangel Chamuel is powerful and compassionate. His sole task is to help you value your uniqueness through self-acceptance becoming a catalyst for change. He helps you treasure your Divine Connection, honoring who you are, knowing you are free to shine brightly. Be willing to step beyond everything you have ever known before this moment, stepping fully into your unique brilliance, expressing all that you are and all you are here to share with yourself, with others, with world.